I'm currently working as an Analyst at the Australian Bureau of Statistics (ABS). As part of role, I am responsible for the design, build and test of survey systems. Some examples of work I do include building editing tools, testing data flow-through between different data storage systems and performing data requests for the ABS, as well as the Treasury and the Australian Taxation Office. What in particular attracted you to studying a science degree at Monash University? During high school I was always passionate about science and could not see myself studying anything else. I attended Monash University open days and I liked the open-endedness of the degree, and the wide variety of subjects available to me. My degree gave me the opportunity to pursue my passions. What were the best parts of studying science at Monash University? I had opportunity to learn about areas aside my major in statistics, such as atmospheric science, pharmacology, physics and chemistry. 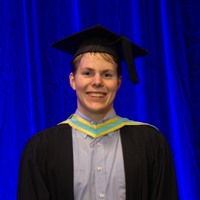 Having the opportunity to increase the breadth of my study gave me additional, interdisciplinary skills which I was able to combine in my honours year, which although was in statistics, covered facets of biology and mathematics. A wide knowledge base is fantastic for creating collaboration between scientists in different fields. Are there any skills that you developed during your science degree at Monash that you have found especially relevant/useful to your chosen career? Communication skills are critical for any scientist. It does not matter how well you know something if you can't communicate it to others! What advice would you give to a prospective student considering studying a science degree at Monash University? What advice would you give them for getting into industry? I would say to anyone with a passion for Science, Monash is the place to be. There is a wide variety of fields to study and you can really choose your degree and cater to your own interests. Your degree will be the main selling point when getting into industry, but you need to make sure that have more to make yourself stand out. This might mean volunteering for a Wildlife Preservation, doing an internship, publishing a paper or working with a Lecturer for a Research Scholarship. You need to know your field and what opportunities are available for you, and who the right people to speak to are. After researching the kinds of jobs I could obtain with a Science degree in Statistics, I saw a Monash Career Counsellor to ensure that I was aware of all opportunities available to me after I completed my degree.